UPDATE 04/18/16: The owner of a pack of pit bulls that killed a man last year pleaded no contest to a felony charge in exchange for a 3-year prison term. John Chester Smith, 63, entered the plea in a Jefferson-Lincoln County Circuit Court and will be sentenced in June, Prosecuting Attorney S. Kyle Hunter said. “The judge deferred sentencing so that Smith could get his business affairs in order,” Hunter explained. 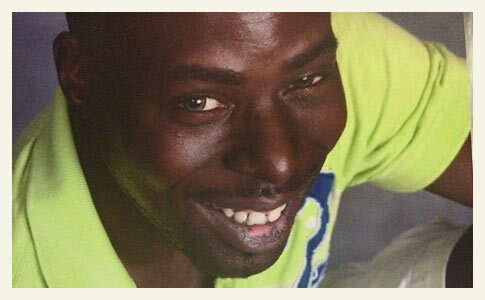 The victim, 36-year old De’Trick Omar Johnson, had no such luxury. “This was a horrible death," Hunter said. "Even though Mr. Smith did not personally cause the death, our position was that there was recklessness on his part because of the dogs and it deserved prison time." If the case had gone to trial, prosecutors had evidence there had been four previous serious incidents involving Smith's dogs. It seems that with four previous attacks, including one that forced a man up a tree, a jury would have convicted and with stiffer prison time. John Chester Smith got off easy considering his knowledge of his pit bulls' vicious propensities, as well as owning a pack of these dogs. On March 21, 2015, De’Trick Johnson of Pine Bluff drove to C.J. 's Garage, an auto repair shop owned by Smith, to have some repairs done on his car. As he waited outside the gate of the business, a pack of pit bulls owned by Smith charged beneath the gate and launched a lethal attack. The dogs destroyed him; one account said the attack lasted 20 minutes. The pit bulls were still tearing out his flesh when deputies arrived; they shot and killed four of the dogs on scene. We are so sorry for Johnson's family members and close friends. We hope the plea deal of a 3-year prison sentence is sufficient. Smith's son, John Smith, and Johnson were best friends. The Jefferson County prosecuting attorney's office announced today that a Pine Bluff man has been criminally charged in connection to the mauling death of De’Trick Johnson last month. John Chester Smith, 62-years old and the owner of C.J. 's Garage, was charged with manslaughter, a Class D felony. Maj. Lafayette Woods Jr., spokesman for the Jefferson County Sheriff's Office, said his office is still waiting on the arrest warrant. Deputies plan to arrest Smith on Friday. Woods was quick to point out in the very first press release that the horrific mauling death of De'Trick Johnson, "furthers the stigma of pit bull terriers as aggressive and dangerous animals" and that in his "personal experiences" pit bulls "are just very loyal. "2 Woods adds in the recent extended interview, "I don't want to alienate the breed. It's not necessarily the breed, its the animal's owners who irresponsibly ignore these signs of aggression in these dogs," he said. Woods, apparently, has never reviewed national fatal dog attack statistics, which clearly show that pit bulls kill more people than all dog breeds combined. His anecdotal "personal experiences" are simply that -- anecdotal "personal experiences" -- ungrounded in statistical reality. Woods fails to acknowledge that many well-raised family pit bulls unpredictably attack and kill family members as well. Woods is a pit bull apologist who also holds the duty to protect the public from harm. During the last 10-year period (2005 through 2014), pit bulls were responsible for 62% (203) of attacks resulting in death. 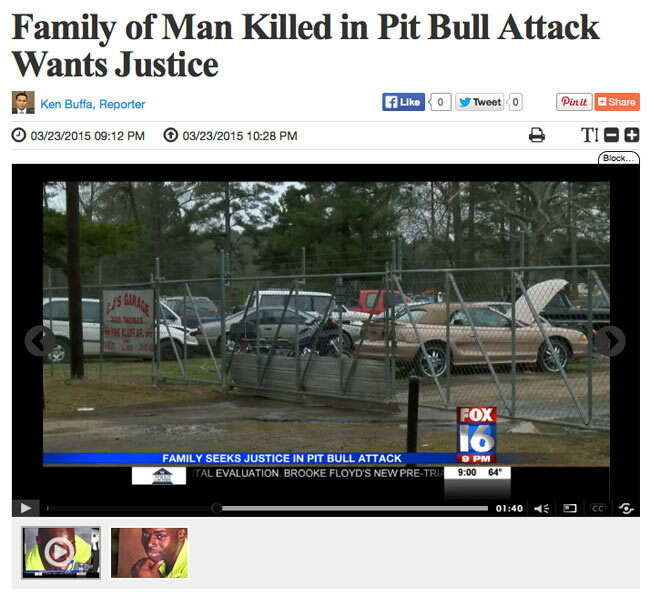 Of these attacks, 53% (107) involved a family pit bull killing a household member. More than half of all fatal attacks inflicted by pit bulls were inflicted upon a family member or person the dog knew well. Predictably, 98% (105) of these attacks occurred on the dog owner's property. What does Woods have to say to these 107 families, or even to this one mother? "I never in a million years would ever think that (Killian) would have done something like that. That was just me listening to the reports and, you know, the experts. ‘Oh pit bulls have to be trained to be aggressive. If they're not trained that way, if they're not raised that way, it's fine.' ... They were the biggest babies. They were spoiled; they were never abused, never mistreated, big babies. I go to bed, they're going to bed (and) they're in the bed, under the covers, on a pillow, comfortable. He was a sweet dog, he was people friendly. The only thing was he didn't like other dogs," she said. - Shannon Easton-Hamer, whose son, Julian Slack, was mauled to death by a family pit bull in 2008. There is no question that the 8 pit bulls owned by John Chester Smith were guard dogs with a track record of bites, attacks and aggression and that Smith was an appalling, reckless owner who deserves jail time. For Woods to go on camera, however, and squarely blame "only the animal's owners" in all instances of violent pit bull attacks is an outrage. Sadly, Woods is just another uniformed voice in the "echo-chamber" of untruths regularly blared by rabid pit bull advocates. New details emerge after the brutal fatal pit bull mauling of De'Trick Johnson just outside of C.J.’s Garage at 300 Thomas Road on March 21. The Jefferson County Sheriff’s Office issued a news release on March 23 stating that the at large pit bull involved in Johnson’s death was shot and killed by deputies on Monday, and another pit bull, previously unaccounted for by the sheriff’s office was also seized. This brings a total of 8 pit bulls: 5 shot dead and 3 seized by authorities. KATV reports an emotional interview with family members and friends of the victim, De'Trick Johnson. At front and center is the victim’s younger sister Akimi Johnson and the victim’s friend of 14-years and roommate, John Smith III, who is also the son of the owner of the dogs, John Chester Smith. Both Akimi and Smith III want to see justice done after De'Trick’s horrific mauling death. "I was not prepared for what happened to my brother," Akimi said holding back tears. Smith told KATV that De'Trick jumped on his car to escape, and "the dogs actually jumped on the car with him because the mud is still on the car when we brought it home." He added that there were previous victims of these dogs. "I'm not just speaking because its De'Trick," Smith said, "I am speaking on the behalf of the other victims because he wasn't the first. He wasn't the second or the third, there was about four to five people that had been attacked by these same dogs." In a powerful statement, Smith talks about his father’s utter disregard for people’s safety just like so many other pit bull owners. "After he bit the first man, what was it in your mind that you couldn't get rid of the dogs then? Then he turned around and bit somebody else and then turned around and bit somebody else then turned around and killed somebody. It's just unexplainable," Smith said. All of his family members had told his father, "You need to get rid of those dogs," Smith said. The same two individuals also talked to Fox 16. It is learned here that Smith was at the early morning scene, but it seems only at the aftermath. He did not witness the violent attack. The Fox 16 footage also shows us the first time we see the "metal siding" leaned up against the front gate of the auto shop, a type of poor contraption designed by the dogs’ owner to keep the pack of dogs contained. Fox 16 also captures images of the remaining pit bulls at the Pine Bluff animal shelter. Sheriff's spokesman Maj. Lafayette Woods Jr. said De'Trick Omar Johnson, 36, of Pine Bluff had taken his vehicle to CJ's Garage at 300 Thomas Road for servicing when he was attacked by the dogs. Woods said a 911 caller told operators that Johnson arrived at the property, exited his vehicle and was immediately attacked. The fatal dog mauling victim has been identified as 36-year old De'Trick Johnson of Pine Bluff. When the first deputy arrived on scene Johnson was still under attack by the pit bulls. Pine Bluff resident Tom Calvert and his daughter witnessed part of the attack. Calvert told THV 11 that his daughter drove up on the scene and saw the man trying to fight off the dogs. She called her father for help. She said, "Dad, come down to C.J. 's Garage! There are dogs chewing this man up." Major Lafayette Woods with the Jefferson County Sheriff's Office told THV 11 that he expects there will be charges filed against the owner of C.J.’s Garage, John Chester Smith, due to previous warrants and complaints. Woods did not provide any specific information at that time about earlier warrants or attacks. Johnson was pronounced dead at the scene. One dangerous pit bull still remains at large. We expect the THV 11 news segment video to air later this evening. 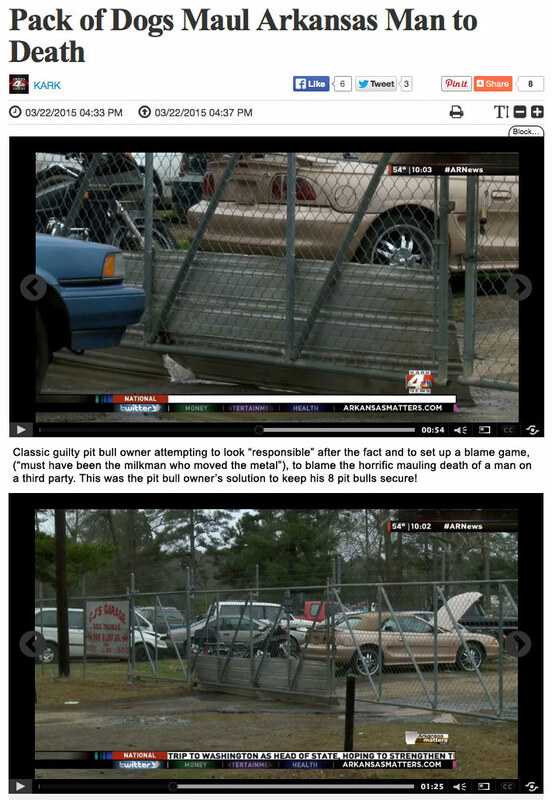 Scroll to see the second video on the THV 11 news report, the interview with Roger Frazier of Quality Fence. Frazier is the victim referred to by commenter Christy earlier today who escaped a similar fate to Johnson by climbing a nearby tree last year. The pit bulls also escaped under the owner's front gate in his attack -- the exact same method of escape in the fatal attack. Frazier is humble and reserved in the interview, maybe because he knows how close he came to death. I was just coming back down the road there, walking back to the shop and five of the dogs, pit bulls, came under his gate and just tore me up. I struggled along the fence to one of those wooden fence posts, got on top of it and got into a tree -- that's the only thing that saved me. They tore my pants off of me. They are ruthless, they surrounded me. And just started biting me all around, everywhere, all over. They just would not quit -- would not quit. Even after I got in the tree, they would not leave, they stayed and stayed. Then when the county sheriff got here, they tried to attack him. [He describes the size and shape of the pit bulls]. They were a litter that they had a while before and they were starting to grow up. Well, what went through my mind is that I knew this was going to happen. I made a point to drive over to his place and tell him what the dogs had done to me. I told him if he did not do something they would kill somebody. I told some other people that too. I told the sheriff that. I said, "Those dogs are going to kill somebody" ... And that’s what they did. 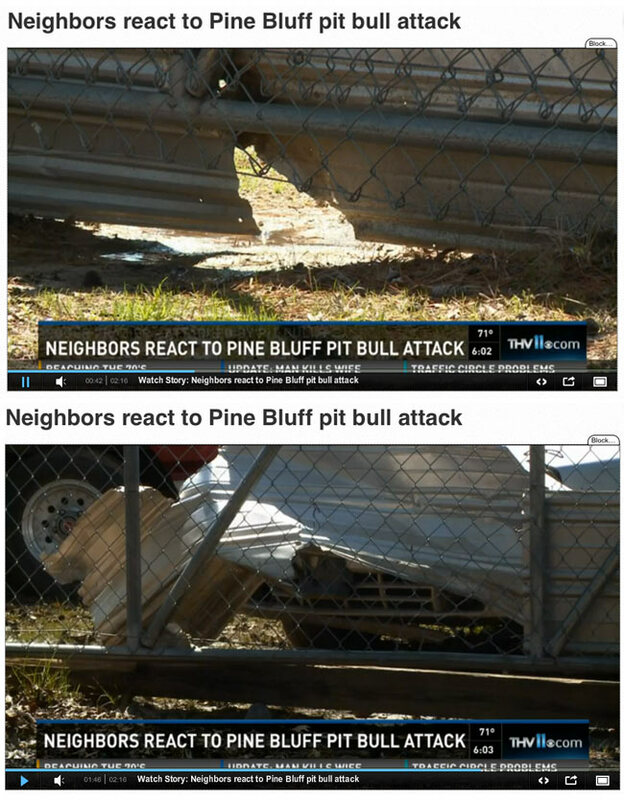 Pine Bluff, AR - In a developing story, a pack of seven pit bulls brutally attacked and killed a man Saturday morning. Just before 11:00 am, a group of seven pit bulls charged beneath a fence and attacked a man at 300 Thomas Road, the Jefferson County Sheriff's Office said. Specifically, the incident happened at C.J. 's Garage, an auto repair shop in the Pine Bluff area. Deputies shot and killed four of the pit bulls on scene, two others were captured and another remains at large. C. J. 's garage is also listed at 300 N Thomas Road in White Hall with the same phone number, a jurisdiction under 8-miles away. The jurisdiction of Pine Bluff bans pit bulls. Arkansas continues to rack up deadly dog maulings. In the 8-year period of 2005 through 2012, there were 3 fatal dog attacks in the state. From January 1, 2013 to present -- just over two years -- there have been 6 fatalities. Two deaths in 2013 involved dogs from the same litter killing two unrelated people. Commenter ChristyInPB at the KATV news article helps explain the jurisdictional issue. The location apparently falls outside of the Pine Bluff city limits; control likely resides with Jefferson County. She wrote that her father "who owns the fence company next door" was attacked by the same dogs 6-months ago. Afterward, her father repeatedly warned authorities to take action or "these dogs WOULD kill someone," but they said the dogs did not live within city boundaries. @ChristyInPB (13 mins ago) "These same dogs attacked my father at who owns the fence company next door about 6 months ago. This was NOT the first incident! If it wasnt for quick thinking my father would not of survived! He had to climb a fence and still was taking by ambulance to the hospital with cuts and deep bites. The paramedic in the ambulance that came was forced to jump on his ambulance to escape them while my father was still in the tree he had to climb up to escape them. When the sheriff showed he was forced to shoot and kill one to prevent him from attacking him!" Also, in 2012, Deborah Rene Wilson Roberts, 45-years old, was mauled to death by her own two pet pit bulls in Jefferson County, Arkansas. The dogs had previously attacked Roberts. View the DogsBite.org Google Map: Arkansas Fatal Pit Bull Maulings. 1Thus freeing the county from any liability. 2Not one major media source used Woods' quotation -- intentionally written by Woods to be used as a quotation by the media -- in the March 21 press release. 3There indeed are time discrepancies. Just after our March 24 update it was released that neighbor William Lever's mother was one of the first to see the attack (unclear how long the mauling had been going on before she saw). Her call to 911 lasted over 8 minutes. 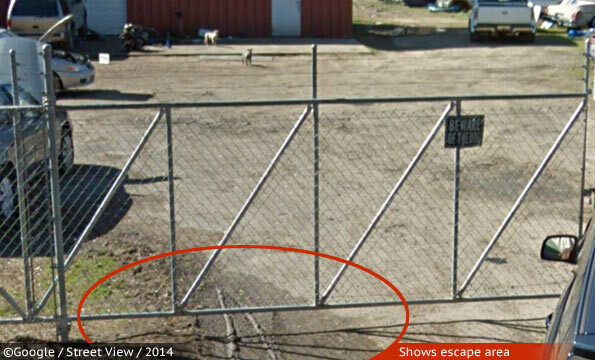 4Was there more than one business at the location the pit bulls were guarding? One has to ask because so many auto body repair and paint shops are used as fronts. The owner AND authorities need to burn big time for this one. Well, after looking at Google Maps, this looks like a good place for an unsuspecting jogger to take a Sat. morning run: 2 or 3 businesses then houses as it gets more rural on a barely 2-lane aging cracked blacktop road and right off a major highway. And, as I was looking at the picture on Google maps…I zoomed in and there are 2 of the pits! This picture was taken about 1 year ago. When will America realize that pit bull advocacy is a front for money making and greed? Not just from the pit bull breeders, not just from the dog fighters, but much of the whole breeding industry is behind this drive to turn America into a war zone littered with bodies. The victim's family member that said "I don't blame the breed" does not understand that propaganda like that comes from the people who killed their family member, the pit bull breeders who trick so many with their sob stories and tall tales that they get teenagers and the unwitting to repeat. This coupled with the criminal negligence of local authorities who lie and say they can't do anything when people are getting violently attacked. Of course they can! There are any number of laws that have nothing to do with animal control laws when it comes to violent attacks and danger, plus they can pass laws easily. I hope that the victim's family has a lawyer ready to deal not only with the pit bull breeder thst killed their loved one, but a criminally and willfully negligent local authority that stood next to that breeder and helped him to do it. "He warned the authorities repeatedly that if not handled these dogs WOULD kill someone!" I hope that people are making these complaints in writing to every local authority, but also to the county and state. The goal is to create a paper trail. It is even better if a lawyer sends the letters, and pretty cheap. It is also good to contact the media, and video evidence and security video is good to have too..
That way the local negligent authorities can't later claim ignorance, or sidestep the issue. Pine Bluff is the county seat of Jefferson County (just under 50k population), so everything is located there, including the central office of the Jefferson County Sheriff's Office. CJ's Garage is "just outside" of city limits and about 7 miles away from the Jefferson County Sheriff's Office building. Frazier's video is chilling in so many ways. That county officials "did nothing" after his attack, which was extremely dangerous and involved a large pack of pit bulls escaping under the front gate of CJ's Garage — never bothered to see if he fixed the problem either — is extremely scary. The man was up in a tree and the dogs had torn his pants off of him in a pack attack, the most dangerous kind of attack there is. What about AC? It seems the county is using the city's resources (Pine Bluff AC). AC had to climb up on the roof of his vehicle; he was scared to death. It seems logical that he also voiced concerns to the sheriff's office. It was a situation in waiting that county law enforcement basically left in waiting. What was going to happen with the 8 pit bulls next? Problems like that never go away on their own. And this is interesting too. There is a white residential home between CJ's Garage and the Fencing company. According to the press release by the sheriff's office, the Garage owner lived there, "Investigators learned through a preliminary that Johnson arrived at the garage to meet the owner, John Chester Smith (63), who lived in neighboring structure." Well, who else would live there? Mary Calvert Margrave This is my brother Tommy Calvert in the video. My family has lived on Thomas street for 70 years plus. I moved from there about eight years ago. Before I moved we had so many problems with dangerous dogs. There were 22 Rottweilers that ran loose all the time. We had so many close calls. We tried and tried talking to neighbor, but he wouldn't do anything. And we called the sheriff dept many times, but they did nothing. So we got our guns and started killing them no matter where we saw them. I did not want them killing our kids or family! They had already killed our rat terroir. They were so aggressive to everyone and everything. We were afraid to walk across our property. By the way, four months ago they attacked Roger that owns Quality Fence co. They ripped his pants off, he had to climb a tree to get away from them! The Dog Industrial Complex has a lot of blood on its hands. These dogs have been attacking over and over again. Those authorities have literally been standing next to this dog owner and providing a clear path for this for a long time. I hope the victim's family holds those authorities accountable. They helped get this man killed while citizens were literally pleading for help and predicting this death. "According to Smith, Johnson put up a good fight. According to Smith, Johnson's death was not the first time the dogs attacked people. “I'm not just speaking because its De'trich. I am speaking on the behalf of the other victims because he wasn't the first . He wasn't the second or the third there was about four to five people that had been attacked by these same dogs,” Smith said. Smith told Channel 7 that the dog s bit another person just days before Johnson's death"
Please post a photo of the pit bulls confiscated from the scene, so people won't be able to claim it was some other breed. Once again, people matter more than dogs. And the public safety must always come first. I keep thinking I'm reading a science fiction novel. A man is violently and horribly brutalized and murdered, after multiple attacks and incidents that the sheriff's department knew about because in one of them, a sheriff had to shoot one of the dogs that was attacking. But sheriff's department spokesman Maj Lafayette Woods seems to only want to talk about one thing- pit bull promotion. He just seems to issue out one propaganda statement after another to try to protect the image of FIGHTING BREEDS. Which of his statements hasn't already been repeated ad infinitum by people who have backgrounds in dog fighting, by people who breed and sell pit bulls, to try to shield themselves and market and promote fighting breeds? Why would he want to dip even a toe into that? Now a law enforcement officer is doing fighting breed public relations work instead of investigating a crime? While some law enforcement departments know their job is public safety and they are responsible to their citizens, there are some government authorities who seem to think their job is protecting the financial interests of special business interests. No victims can assume anymore that their voices are being heard and documented, so it is absolutely necessary to be filing complaints not only with animal control and the police, but also all legislators in the area. In this case, people needed to escalate to the state, because the sheriff's department was putting them all in danger. There need to be registered letters, there need to be copies of reports collected and scrutinized for accuracy, and there really need to be lawyers involved much sooner than after the inevitable fatality or disabling mauling. Because victims are being told too often that their complaints never happened. If authorities can get away with that, they will never feel a need to address the problem. Make sure complaints are documented in every way possible so no one can say they never happened. I think its great for people to work to change laws, and hold these so called AC/ Sheriffs/ etc accountable. However, all the letters in the world can't do what guns can. I applaud that woman above, whose family had the courage to do the right thing and shoot deadly dogs. We must quit expecting law enforcement to protect us, as it's clear that they will not. They are too busy pushing pits, protecting them, and trying to save their reputation. It's ridiculous. This exemplifies why dogs need to be put down after the FIRST attack and why pit bulls are not good pets or guard dogs. I hope the family sues and enjoins animal control in the lawsuit for not doing their job.